This time a light subject for a science-related blog. It is about upcycling your fabric conference poster. These posters are very easy to bring to a conference as you can just fold them and put them in your suitcase. So they have rapidly become very popular. These fancy posters are however quite expensive to get printed and it feels like a waste to just discard them after a conference. 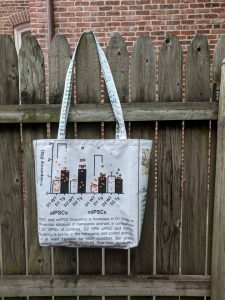 I found that some creative scientists make interesting tote bags from the fabric posters they got printed for conferences. That way, the poster is still useful after a conference, and you can have a cool conversation starter for the next meeting. 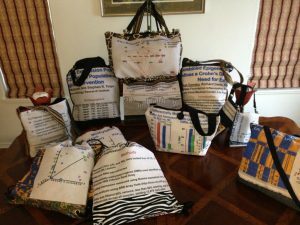 No more boring conference bags! I came across a nice example on twitter and found some additional posts by some creative scientists who re-used their fabric conference posters. If you are creative and still have a poster hanging somewhere with last week’s results you should get started. 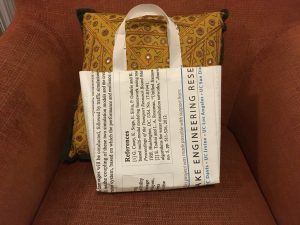 Tote bags made of upcycled conference posters may just become the new trend at your next conference! 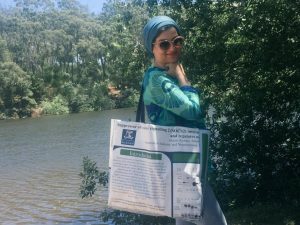 Perhaps the first one to post a picture of a tote bag made out of a fabric poster was Akram Zamani, known as @AkramZamani82 on twitter, a postdoc in pediatric brain injury in Melbourne, Australia. Akram posted some crude but straightforward instructions ´just sew the similar symbols together´ with the below image. There is also a great example (at the top of this page) by neurobiologist Crystal Lantz. Crystal is from the University of Maryland and goes by the name of @BoozyBrain on twitter. 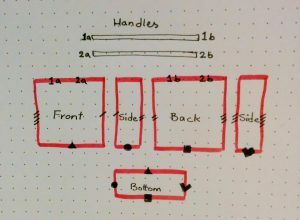 She even wrote a whole blog with very detailed instructions on how to make the tote bag. 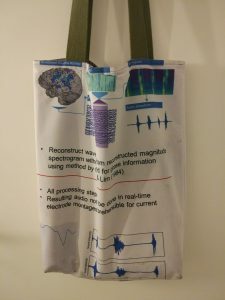 Another neuroscientist who had a tote bag made out of a poster is Christian Herff, @HerffC, a postdoc from Maastricht University in the Netherlands. His tote appears to have a more simple design. You may not need to be a neurobiologist or neuroscientist to be able to make a bag out of your poster, but it sure does seem to help! 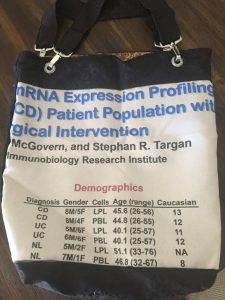 Below are some bags by non-neuroscientists: Dermot McGovern, known as @doc_ibd on twitter, is in IBD genetics at Los Angeles and Bingyu Zhao, @BingyuZhao1, is working on something like city planning or mapmaking at the University of Cambridge, UK. So find those abandoned posters and transform them into something pretty and practical! And please send me a picture so I can include it here.